In 1853, the first Greek-letter fraternity, Beta Theta Pi, was installed on Ohio Wesleyan’s campus. Faculty originally opposed the introduction of Greek life to the University community because they were seen as raucous organizations. Early Greek organizations came together to prove themselves as men and women committed to their academics, as well as to their community. Since then, Greek life at Ohio Wesleyan has grown and thrived. You’ll become a part of this rich history if you Go Greek! In 1870, Ohio Wesleyan trustees banned fraternities because they were “unfavorable to morality, harmony, and economy.” Meanwhile, advocates argued that the best educational centers were those where fraternities flourished. The advocates won, and fraternities were re-instated in 1873. Riding the crest of the reinstatement of fraternities, three sororities were introduced in the early 1880s, but had a short life before they were disbanded by a faculty edict. Anti-Greek voices cooled in 1888, when President Charles Payne, a fraternity man himself, announced, “It is the policy of Ohio Wesleyan to recognize, utilize and evaluate fraternities.” Under this umbrella, sororities reorganized themselves as local clubs, with non-Greek names; however, the women themselves voted the clubs out of existence in 1912. When fraternities opened residential houses in the 1920s, they seriously challenged the popularity of literary clubs. 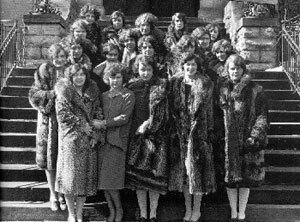 From 1923 to 1925, nineteen Greek-letter sororities also reappeared on campus, without residency capabilities. 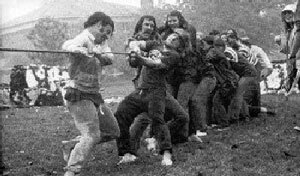 Two groups with non-discriminatory clauses were also strong during this time: the Ohio Wesleyan Union and the Ohio Wesleyan Commons—which became the Brotherhood of Ohio Wesleyan Men. During my first semester, I did not pledge a sorority. 86% of the women and 97% of the men did… Soon, however I became aware that one was considered a wallflower—almost untouchable in the Wesleyan caste system of the 1950’s—without a chest full of pins. Greek members confirmed that affiliation provided them with social and intellectual stimulation and challenged them to high moral and spiritual ideals. Many OWU alumni remember with fondness the special bonding and sense of community fostered by Greek associations. During the 1960s, Greek organizations across the country experiences drastic declines in membership. By 1970, Greek membership at OWU dropped to 55 percent of the men and 47 percent of the women. OWU President Smith identified three reasons: First, with newly constructed residence halls, the fraternity function of housing students was no longer essential. Second, the increased academic pressures were forcing students to make tighter choices in the way they spent their elective time. Finally, the social consciousness of the day made students question an organization that “places more emphasis upon a man’s color of skin, religious background or national origin than it does upon personal character, basic integrity and intellectual capacity.” In 1964 the Board of Trustees adopted a policy requiring all campus organizations to eliminate discriminatory membership clauses. As Ohio Wesleyan entered into the 1990s, 53 percent of the student body belonged to 13 national fraternities and 8 sororities. The fraternity houses on “The Hill” continued to be the hub of much campus social activity, with parties, formals, serenades, Derby Days, mystery dates, and dinners. From: “150 Years of Excellence; A Pictorial View Of Ohio Wesleyan University.” Copyright 1991. Published by Ohio Wesleyan University. Currently, fraternity and sorority life makes up approximately 25 percent of the student body. Fraternity and sorority groups continue to emphasize leadership, scholarship and community service projects, such as collecting donations of money, food and clothing for worthy causes, sponsoring a Halloween Haunted House, landscaping a local elementary school, raking leaves and chopping wood for senior citizens in the Delaware Community.